Built in 2015-'17 by Kership (Piriou à Concarneau) for the French Navy, launched on 22-08-2016, in sevice on 04-07-'17. Patrol ship B2M (Bâtiment Multi Missions) of the d'Entrecasteaux class, displacement:1500/2300 tons, L:65m. B:14m. Draft:4.20m. 5 kn. range:5000 nm. at 12 kn. complement:20 + 20 troops, armament:2-7.62 mm. canons, 1 crane SWL:12 tons. 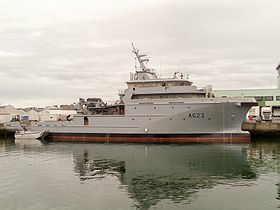 The D'Entrecasteaux class is a class of oceanic patrol ships of the French Navy. 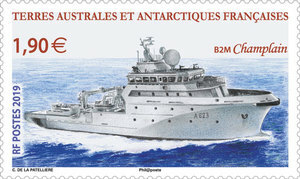 The ship's designation is Bâtiment multi-mission in French (B2M, "multi-mission ship") and also dubbed the "Swiss Army knife of the Navy", the type of ships is designed to perform sovereignty, law enforcement and logistics missions (such as policing illegal fishing, traffics and mining; assisting distressed ships, and search and rescue; and contributing to the logistics of Overseas collectivities from, replacing the aging BATRAL-class landing ships in this role. (TAAF 2019, €1.90, StG.?) Internet.